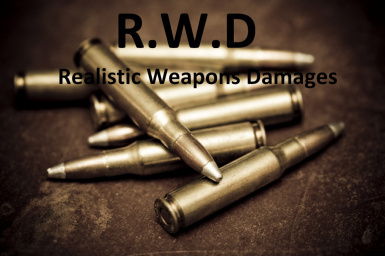 This is a compatibility patch I made for Imperfection mod by DeathClawAlpha and Realistic Weapon Damage by Wrankss. DeathClawAplha and Wrankss for their mods. There is no need for a detailed description, but still here's one. This isn't my first mod, but rather my first public mod. I felt that was pretty usefull and didn't see a patch for that so I put it here. It's a little patch which took me almost... five minutes, and most of this time had been waiting or the GECK to start up correctly. So I take no thanks at all for this. I love so much Imperfection by DeathClawAlpha, and I love so much RWD by Wrankss, which both add a survival dimension to the game. I haven't asked permission to these dudes because the mods are dated, but I will eventually contact them because, respect you know, and give them the file if they want to put it in their own pages. EDIT : I contacted the authors, hope anwsers will arrive soon. There is no language at all because it touches only hidden content, bodypart data, so I shouldn't be incompatibilities, after all, it's a compatibility patch. If you love RWD and Imperfection, you should probably go for my little patch, and all credits go to those two guys for their awesome mods, obviously. For the load order, see the pages linked just before, my patch should be placed after those two and all the patches related to them - the DLC compatibility patches for example. EDIT : This doesn't even need RWD as a master, only Imperfection (obviously) is really required. As a matter of fact, it only alters Imperfection bodyparts data, and owns the name of RWD only because of Wrankss excellent idea, as an hommage, should I say. Some credit should also be given to Bethesda for this game, and the GECK. You cannot upload this on another website without at least telling me by private message on the Nexus. Also you cannot take the patch file and say you are the author, even if it's easy to make it yourself.